This was a very enjoyable recent weeknight dinner. 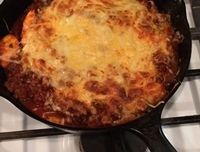 The cheesy polenta skillet recipe came from Cooking Light. Rather than using packaged polenta I followed the outline of Ina Garten’s polenta recipe. However I omitted the parmesan, crème fraiche, and butter. I put the polenta in a cast iron skillet and put it cooked it on the stove top for several minutes. I then prepared the meat mixture in the sauce pan in which I made the polenta. I used ground beef rather than turkey and seasoned it with smoked paprika. I put the mixture on top of the polenta in the skillet and topped it with grated parmesan and shredded Monterey Jack rather than mozzarella, as I had the jack on hand. It turned out really well. Terry went back for seconds.